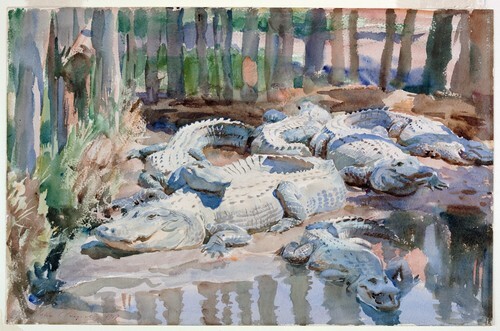 My latest at The New Criterion, on the must-see, soon-to-depart "American Watercolor from Homer to Sargent" at the Philadelphia Museum of Art. It’s possible to detect a thread that stretches from the Boston Water Color Club to the circle of Alfred Stieglitz, from there to The Club that was the intellectual hub of the abstract expressionists, and from there to Andy Warhol’s Factory. I believe that this ability to steer artistic taste is an idea that still has life in it, and with communication technology more powerful than ever, ought to be taken up again. One just needs to summon the optimism, and rally people behind a singular advancement. The reason this sounds so good to me is that it is also so improbable. Each of the groups you cite was relatively insulated from the world at large, which might be a necessary circumstance required for the formation of the essential guidelines and boundaries that make it possible to achieve something specific. Now that communication has become so quick and completely thorough, insulation is hard to come by. While interlopers can be kept out, as they were in each of these groups, information-about-everything serves something like the same function, intruding on the cloister that otherwise would serve as the foundation for what is to come. We know too much about too many things. Hope does spring eternal, even as I write pessimistically. As it happens, I had a particular group of creators in mind when I wrote that. I'm being cryptic about who they are for exactly the reason you cite. Seeds need to be left alone for a while in the soil's darkness.